Ask A Vet: What's The Best Natural Food For My Dog? Is your pet a wolf in a cute outfit? When you look in your dog's eyes do you sometimes see a Wolf? Did you know your dog’s DNA is only 0.2% different than that of the Gray Wolf? The difference is so small that they are both classified under the same species name, Canis Lupus. They are genetically identical to wolves. Why is that important? It means our fur babies have the same digestive tract as Grey Wolves and are designed to be meat-eaters, otherwise known as carnivores. Carnivores have a relatively short digestive tract and they depend on their prey to provide most of the amino acids, enzymes, and probiotics they need to supplement their primary protein diet. Herbivores have entirely different digestive tracts than carnivores. Herbivore's digestive tracts have specialized bacteria for the breakdown of plant material and other organisms that produce many of the amino acids that cannot be produced in the carnivore’s digestive track. 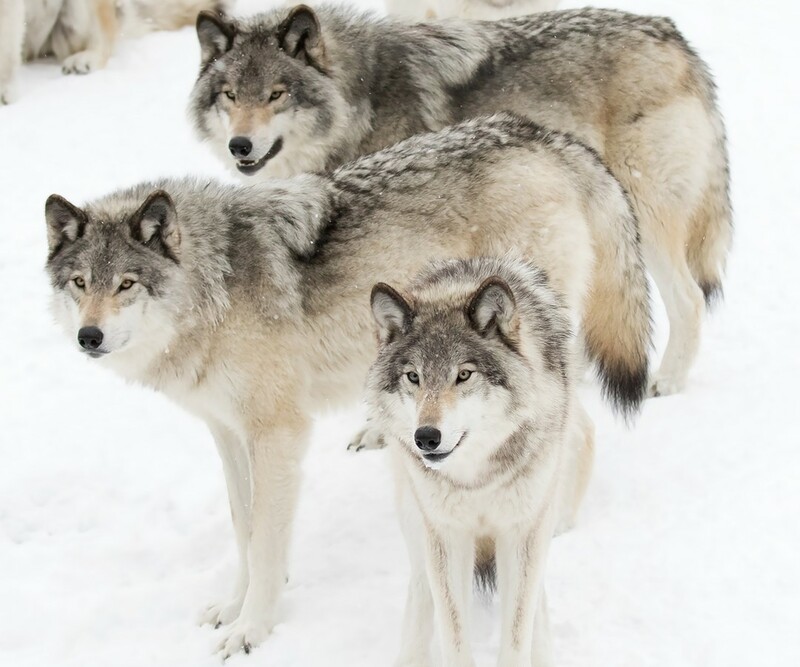 In a wolf pack, it is the alpha wolf that gets to eat first and he or she will instinctively choose the tender organs, particularly the liver, which contains the densest nutrition. The alpha wolf also consumes the parts of the digestive tract that contain billions of micro-organisms and fermented plant material. This fermentation process in the herbivores' pre-stomach breaks down the plant material into amino acids and is also a great source of digestive enzymes. Carnivores rely on their prey to provide the amino acids and digestive enzymes they cannot produce themselves. The pancreas of the carnivore does not produce enough of the enzymes required to breakdown protein, fats, and starches (protease, lipase, and amylase). In fact, it doesn't produce cellulose at all (an enzyme required to breakdown cellulose into glucose molecules). 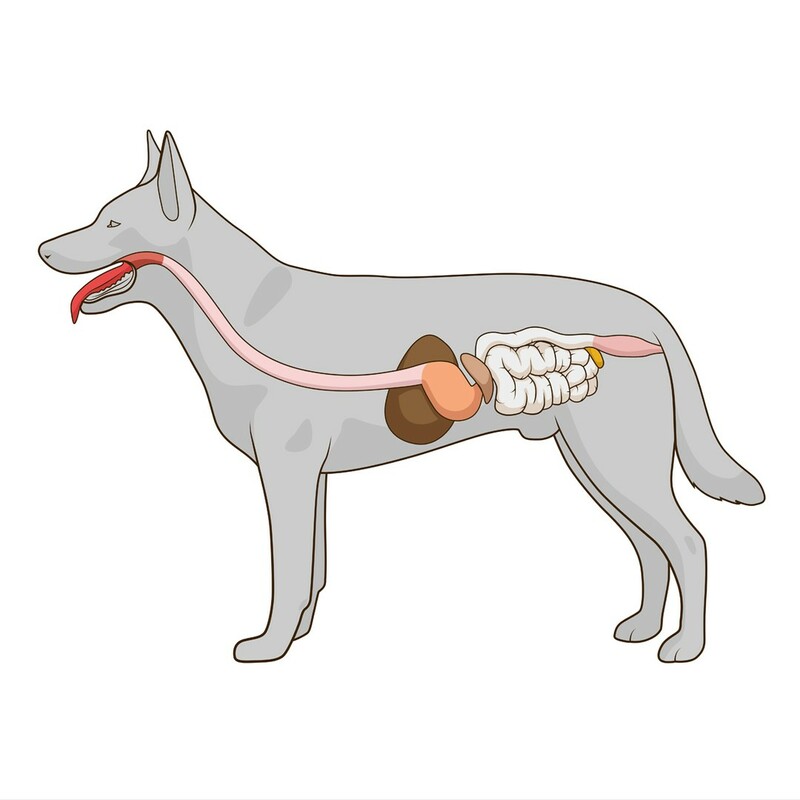 There are also other important enzymes besides digestive enzymes; like the enzymes responsible for the assimilation of vitamins and antioxidants that unlock the nutritional benefits of food allowing them to be absorbed and utilized by the dog’s body. For instance, fresh raw muscle meat contains natural live proteolytic enzymes for breaking down muscle protein into polypeptides and amino acids. Eating organ meat such as liver and pancreas also provides those critical supplemental live digestive enzymes. Not supplying these supplemental digestive and nutritional enzymes taxes the dog’s system and opens the door for a plethora of metabolic, chronic and developmental diseases. Most carnivores cannot produce all the amino acids required for optimum health. The Canine requires 22 different amino acids and can only synthesize 12 of them. The other 10 amino acids are considered essential amino acids and must be supplied in the diet. Dogs do not digest, assimilate or utilize plant material very efficiently and plants are not a very good protein source for them either. Plants like soybean meal, wheat, rice, and corn have limited usefulness for carnivores, regardless of what pet food manufacturers claim. In addition, corn, soybeans, cottonseed, and Alfalfa are 80 to 93% GMO crops. GMOs are plant or meat products that have had their DNA altered in a laboratory by genes from other plants, animals, viruses or bacteria. For example, genetically modified corn contains a pesticide that cannot be washed off. Most GE (genetically engineered) food grown in the U.S. is “Roundup Ready,” meaning it can withstand the spraying of Monsanto’s Roundup pesticide while killing the weeds around it. Of course, there are now “super-weeds” that require increased amounts of Roundup to kill them, a nice perk for the manufactures of Roundup, but not very healthy for those consuming these pesticide-laden foods. Research links GMOs to allergies, organ toxicity, and other health issues, even though the U.S. Food and Drug Administration does not require safety testing for GMOs. 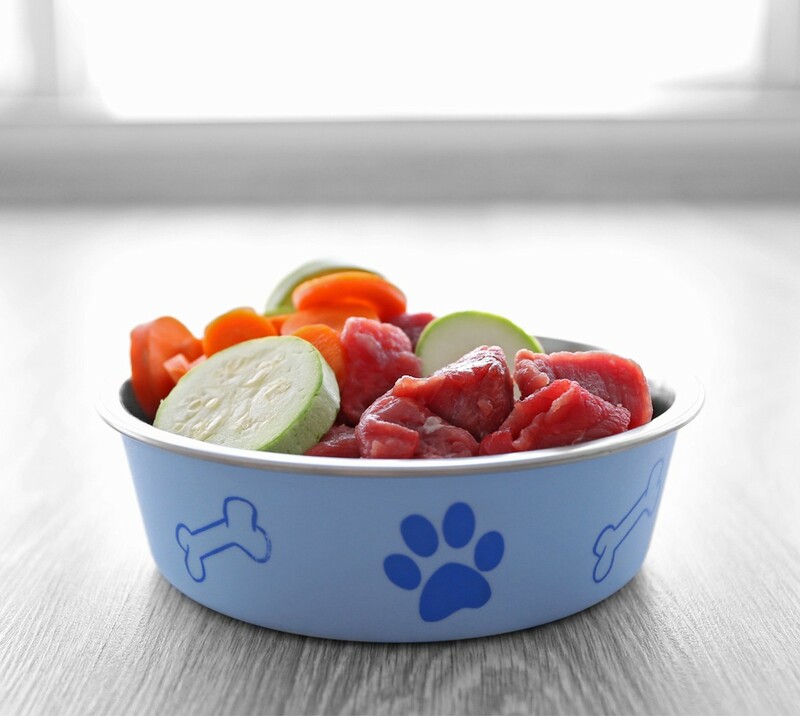 It is essential that the foundation of a dog’s diet be viable protein sources. Grains like corn, soybeans, and wheat do not provide this wide range of amino acids. It's not just the grains that need to be limited in a dog’s diet, but also vegetables that are high in starch like potatoes, pea protein, and yellow peas. Starch is broken down into sugar and regardless of the source, sugar feeds a host of negative metabolic processes in a dog's body. We are just beginning to learn how these metabolic processes lead to inflammation, degenerative diseases, and cancer. Viable protein sources for carnivores include beef, bison, eggs, fish, elk, lamb, chicken, turkey and goat, all of which provide a broad spectrum of amino acids. The dilemma then, is how do you provide your pet a species appropriate diet? It's almost impossible to provide all the nutrients a wolf would get from eating fresh prey, however, with the advent of supplements that contain probiotics, low-starch prebiotics, and digestive enzymes, you can approximate that diet. Advice from a holistic veterinary nutritionist can be very helpful. 1. Dogs are carnivores. The foundation of their diet should be meat - raw skeletal and organ meat to be exact, and the fresher the better. - Fresh raw skeletal and organ meat from organic, free-range animals is the very best option but not very practical. - Freeze Dried raw skeletal and organ meat from organic, free-range animals has been shown to preserve the nutritional value while making it convenient to feed. 2. Use a high-quality supplement containing probiotics, low starch prebiotics, and digestive enzymes. - Heat, pesticides, herbicides, food preservatives, additives, artificial colorings, and flavor enhancers easily destroy enzymes. - If you need to partially cook the meat, wait until it cools and then add supplements like enzymes, probiotics, and omega fatty acids. 3. A small amount of fresh, organic vegetables are good to add to your dog's diet, as well as herbs as they supply micronutrients. If your pet will tolerate them, fermented veggies work well. - This is where a consultation with a holistic veterinary nutritionist can be very helpful. 4. Avoid diets that are heat processed (99% of all kibbled dog foods). 5. Avoid raw meat diets composed only of meat, that will certainly create a nutritional imbalance. 6. Read the label for not only the components of the diet but where the ingredients are sourced. - Remember that most major dog food companies have stockholders and their first allegiance is them and it is always profit over health benefits. Okay, I know, you may be saying, how could I possibly have enough the time to buy all the ingredients and prepare these meals for my dogs, every day for every meal? I get it, I have a Great Dane. But there are ways to do it, depending on where you live and your budget. Some people get a group of dog owners together once a month and make raw diets and freeze them in daily portions. 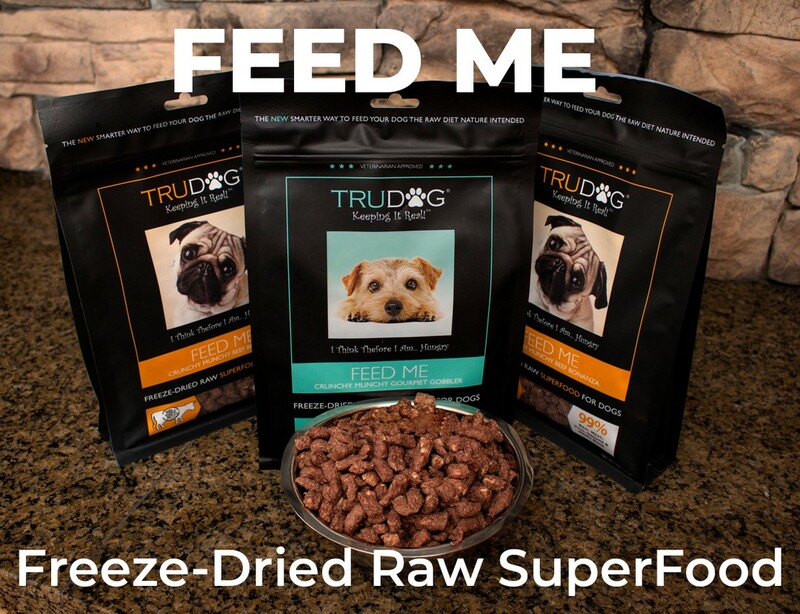 Others use prepared Freeze Dried raw diets like TruDog©, along with their digestive health supplements. Feed Me is made from humanely, USA sourced beef and turkey. Check the ingredients label and you'll find quality cuts of beef or turkey meat, organs, bones and blood - NO grains, fillers, additives or artificial anything! TRY FEED ME TODAY, CLICK HERE! This post is written by Dr. Jan Hale, DVM.